IF EXPECTATIONS DO NOT EXCEED OUTCOME, UNHAPPINESS IS THE RESULT. This is the reason a high majority of high school basketball players rate their experience as unhappy. Crowell has a solution! Athletes, here is the hard reality. It is rare a coach will do what is best for you! It is human nature to do what is best for oneself. If this offends the coach, it is indication this coach is among those most interested in their own personal welfare. Hope your coach in school or summer does not fit this description. 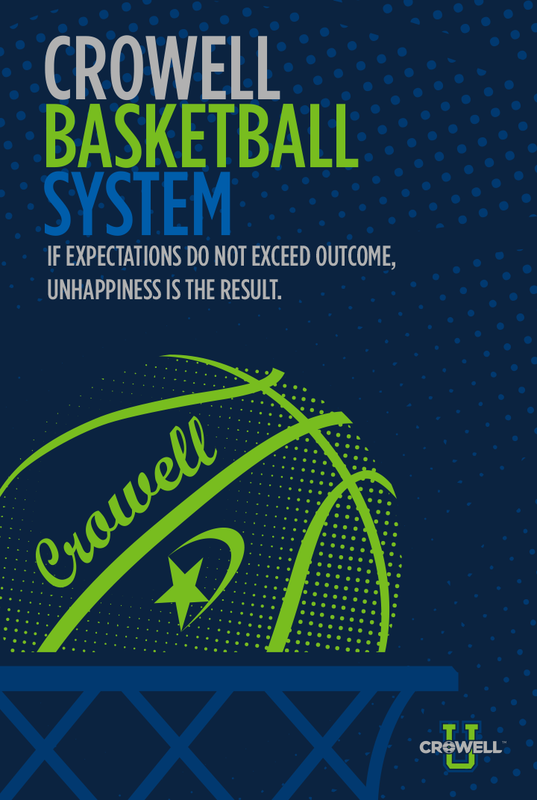 The Crowell Basketball System is based on over 60 years of life experience. 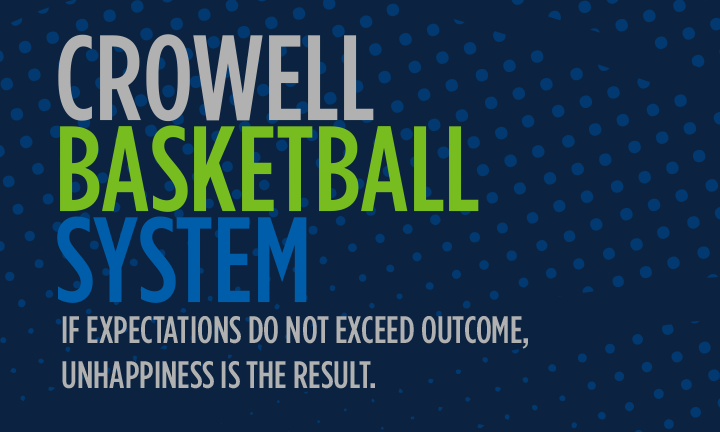 If you master Coach Crowell’s basketball system as an athlete, parent, or coach you will have both emotional intelligence (EQ) skills, the most valuable, and IQ skills to know and understand both basketball and LIFEBALL to a high level of excellence. 1.) Basketball skill is a personal skill building experience. It is not a games only experience because 5 on 5 play is not an effective way to get better in the summer time. Basketball math proves this fact. High school games are 32 minutes long. 10 players all playing the same amount of time means each player gets 16 minutes.Crowell solution to personal basketball excellence: Learn to love hard work; delight in self-discipline. Become a life-long student of EQ! 2.) Coaches can’t have it two ways. They get one way. You either build individual skills or team skills. 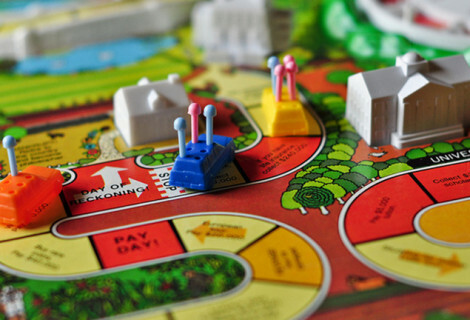 If you play to win the game only, the best players play. If you play all 10 to 12 players the same amount of time, you lose the game. The two or three best players will play the majority of the game and 8 through 12 get few game minutes. This is the reality of team camps. Not saying they are not a good thing; just saying this is reality. 3.) Exposure is a myth: Travel ball to big exposure tournaments is not the way to get a college scholarship. Hard work, dedicated to practice hours and hours all alone, is the answer. I guarantee if you are good enough, Coach Jim Harrick or I, at the Crowell Camp, can make one phone call and get you a look at any level of play from Elite universities like UCLA to Virginia to Gonzaga or Oklahoma. D2, D3, Community colleges, the same goes. 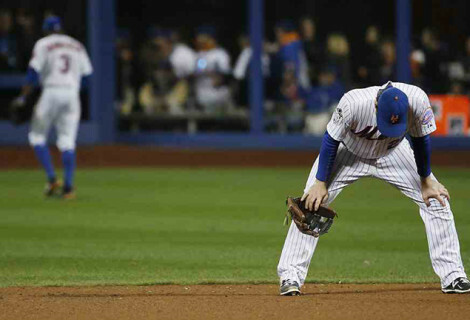 The hard cold truth is, Can the kid play? First question asked: “Who is recruiting you in your local area?” If no one, you better get better fast! Crowell Solution: Crowell Camps at NBC Camps are a good choice: We train each athlete to self-diagnose their weaknesses both physically and mentally and develop a personal plan to get better before the next basketball season. Each athlete will be coached on the “how to” of preparing a personal game plan to play at the highest possible level. Dreams to goals to reality is a learned process. We coach you how to coach yourself. 4.) Emotional intelligence training is the most important, least taught educational skill. EQ is the “I want to“ versus the “how to” element of life. For this reason, the Crowell Basketball System is unlike any camp experience I know of in my 50 years of coaching, dating back to my days as head coach at the University of Alaska Fairbanks. Crowell solution: I fully admit Crowell Basketball is not for the games only coach or player. 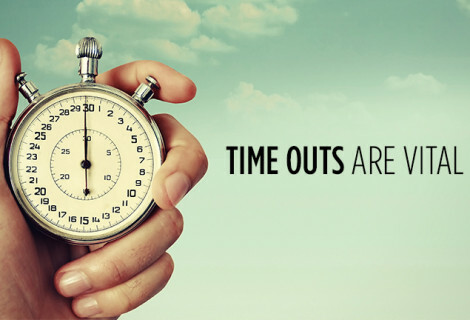 Athletes or coaches who do not prize self-discipline, honoring authority with respect, being on time, and personal excellence, should avoid Crowell’s programs. Hard work is not nearly enough in my book. THE LOVE of HARD WORK is the essence of LIFEBALL and basketball success. 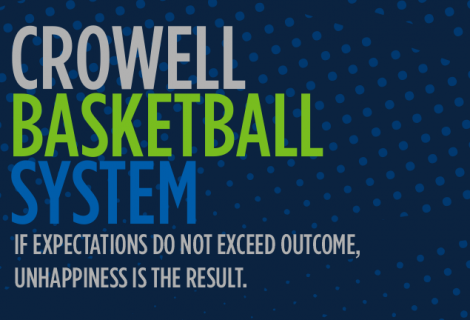 If sleeping in, goofing off late into the night, and living on the cell phone is more precious than being right here right now, it is impossible to master the Crowell Basketball System. 5.) Basketball does not build character; basketball reveals character. When a serious basketball player gets a technical foul in a crucial part of a game, is not actively engaged in school with a commitment to get A’s and B’s, does not bring honor and respect for his family with quality behavior, and lies about breaking team training rules. All of these make the game of basketball of little value. Basketball is a short lived life experience for 99% of high school students. Crowell solution: Basketball is a game; life is a game. The better you get at LIFEBALL, the better you get at basketball. The Crowell experience is three fold: 1) Create an atmosphere of safety both physically and emotionally. There is zero tolerance for bullying, bad behavior or abusive coaching. 2) Each athlete is a miracle and deserves to be coached with dignity and respect and receive equal playing time. 3) Respect for people, self-respect, and respect for property are prized virtues in the Crowell Basketball System. Crowell Expectation: Each coach and player returns home a better person. Crowell’s hopeful reward: Parents see a difference in their son’s attitude and behavior. Love life, love family, love people, and love God is my hope.